Palm Springs meets Spring Hill at the The Johnson hotel’s pool deck (photo: Celeste Mitchell). Celeste Mitchell checks in to the first Brisbane foray for Art Series Hotels to see how an old government office block has been given a new, rather colourful, lease of life. Art is subjective, but then again, so is a hotel review. What one person likes is confounding to another. What’s charming to some will be dishevelled to others. At The Johnson in Spring Hill – the first Queensland hotel for the Art Series group – there aren’t quite enough guests right now to draw a poll. I’ve booked in for one night before an overseas trip and the back half of the property is still under construction, that’s how fresh this hotel is. But after I step out of what looks like the service elevator, the juxtaposition from tradies to sparkling lobby couldn’t be more surreal. Art Series Hotels centre around a singular artist of note, and in this case it’s abstract painter and vivid ‘colourist’, Michael Johnson – winner of the Wynne Prize in 2014. He may not hail from Queensland but a significant chunk of his artistic muse is said to have come from his time in Port Douglas – the resort town igniting his trademark impasto layered paintwork and heavily imposed colour. Pops of colour feature throughout the hotel in Johnson’s art (photo: Celeste Mitchell). Instantly, I’m a little in love with the large-scale pieces that hang in the lobby, hallways and rooms, overtaking crisp white VJ-panelled walls and popping from the largely neutral palette. They have an almost hypnotic quality; like looking through a vivid kaleidoscope. Being that the doors only opened four days ago, I’m unperturbed by the fact some staff members seem to have their training wheels on and an explanation of the facilities is not offered. But I find the parking situation a little confusing, and have to move my car after discovering I’m in the wrong spot. A few teething issues, but not all bad! The generously sized Deluxe Studio Suite Twin of The Johnson in Queensland (photo: Celeste Mitchell). And, although I had booked a Studio Suite with a balcony, it’s only after I’ve settled in and sprawled my luggage across the two beds that I realise I’ve been unknowingly upgraded to a Deluxe Studio Suite Twin. This would be a bonus if it had a balcony like the room I’d booked. 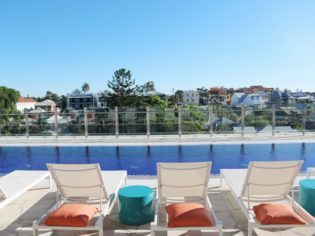 The Michael Klim-designed lap pool on the fifth level has views out over Spring Hill, which is like a lesser-known New Farm with terrace homes and cute worker cottages interspersed with student accommodation and serviced apartments. There’s a bit of a Palm Springs vibe looking up at the white exterior and balconies above the pool deck, blessed with a row of sun lounges, booths and low-line seating, which I expect will be pumping come summertime. My key wallet turns out to be a handy fold-out local guide with bang-on recommendations – coffee at John Mills Himself, for example – but I opt for dinner with a friend at Tumbling Stone. Inspired by Michael Johnson’s piece of the same name, the on-site restaurant is sprawling but well segmented into zones with chain-curtains, booths, and a relaxed lounge area. We order a few share plates; the Chianti by the glass is lovely and goes well with the Bangalow sweet pork and fennel meatballs with Napolitana and parmesan. When I retreat for the night I note that my room is larger than some apartments I’ve rented in Sydney, with a full kitchen, wardrobe and lounge area. The fridge is stocked with local Balter and Green Beacon beer cans and fluffy robes hang in the wardrobe. The grey, white and timber colour scheme is punctuated by a punchy red canvas above the small dining table, a quirky coat rack that looks like water (or blue slime) dripping down from the doorframe, art tomes stacked on the timber built-in desk, while a small basket holds popcorn, lollies and mini bottles of booze. A window peeks into the slightly-aeronautic bathroom and inside I appreciate the fun Evo amenities (soap dodger body wash, anyone?). There is no bath, just a utilitarian shower and toilet hidden behind frosted glass. Turning in, I slip into the crisp sheets and pass out immediately. Heavy black-out curtains ensure I sleep solidly; a blessing before a 14-hour flight. If I had more time I would join one of the complimentary art tours, and if I had more disposable income I might consider purchasing one of Johnson’s paintings. Instead, I order the chilli scrambled eggs in Tumbling Stone and appreciate that art comes in all forms. 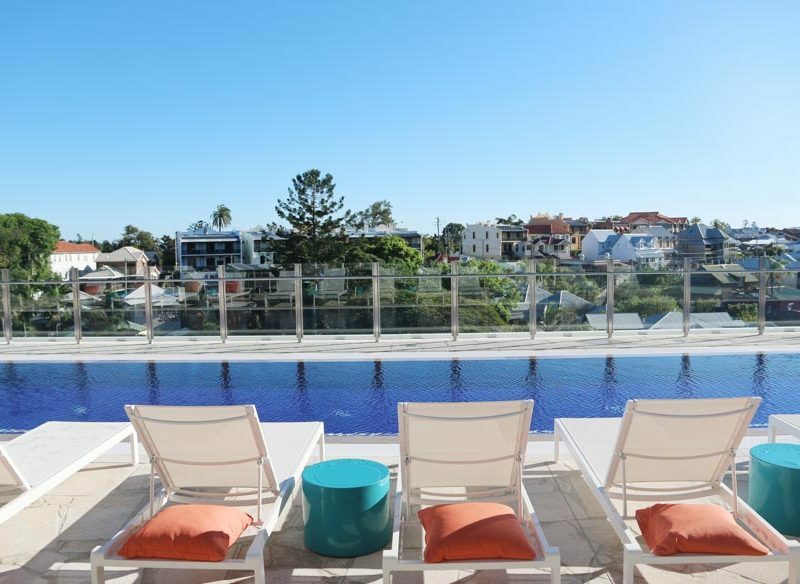 Verdict: A vibrant addition to inner-city Brisbane with beds you’ll want to take home with you. We rated: The fabulous pool and the large communal-working-style table in the lobby, from where you can appreciate Johnson’s work. We’d change: The clinical bathrooms. Notes: We paid $180 for an ‘opening special’ one-night stay and $25 extra for parking.